Through the erratic traffic of Bombay, also known as Mumbai, over bridges and under railway lines, along curving sea-front boulevards, flashing posters, crawling beggars and afternoon worshippers, we finally edged our way into the nearby town of Trombay and a checkpoint. "Is this Barc?" I shouted from the window, and a woman selling vegetables, pointed lazily at the compound ahead. As our van pulled up, Dr A P Jayaranam, publicity director for the Bhabha Atomic Research Centre, stepped out of a guard house with a beaming smile. "You are Mr Hawksley, and you found us," he said - neither a statement nor a question - tucking his crumpled white shirt into his trousers. Dr Jayaranam was embarrassed. "I am so sorry for all this," he said. But you know we are nuclear weapons facility and many nasty people want to get in here." Lined up on the other side of the checkpoint were five grey buses, the sun reflected off the grubby windows and faces leaning tiredly against the glass. Anywhere else they could have been prison inmates or workers from a car factory. But these were India's grade A scientists on a shift change - the men and women who are creating India's nuclear arsenal. India is an unfathomable country. A solid democracy which America regarded as a Cold War enemy. A booming economy which has delivered less wealth to its people over the past 40 years than Nigeria. And, because of its nuclear bomb, it's now a live-wire embryonic super-power. Barc is a vast complex. Some five miles ahead of us, further than we were allowed to go, was the sea. We were flanked by mountains, underneath which laboratories had been hewn, where 5,000 scientists and 10,000 technicians work. Hidden among the lush tropical greenery outside were satellite dishes and radar - presumably to detect an enemy attack. The buildings were dowdy Soviet-style from the 50s and 60s - the era when India's weapons research began. Of all its fluctuating policies, the nuclear programme has remained constant. Like a proud real-estate agent, Dr Jayaranam showed off the exteriors of two nuclear reactors, one built with British help, the other with Canadian - and both - experts believe - used to extract weapons-grade material for bomb making. Outside was a walkway and a fountain. Inside, he introduced us to the director, B Bhattacharjee, skilled in gas centrifuge technology for uranium enrichment. Dr Bhattacharjee leaned forward enthusiastically. "If we are asked at any time 'can you help us?' our answer should be 'yes'. That's from any sector - either the navy or the army or the air force. We are always prepared to meet any needs for the country." "And the weapons," I added with hesitation. "They are here, now." "Yes. The nuclear weapons are designed here, manufactured here and we keep them here." In fact, that's just a third of a complete nuclear weapon. In Delhi, a former defence planner explained that the part known as the pit - the nuclear element - was made at Barc. "The pit goes into the warhead," he said. "And the warhead is kept in another place. And the delivery system - that is an aircraft, a missile of a submarine - is in another place again. It would take something from six to eight hours - maximum 12 hours to get the complete weapon assembled and ready to launch. Then it would take about 11 minutes to impact on Pakistan." So, India has a no-first-use policy, which Pakistan does not. In other words, India is prepared to absorb one strike - sacrifice at least one city. Then, no more than 12 hours later, after it's put its weapons together, it would hit back with everything it's got. My last stop was to drop by and see the American ambassador, Robert Blackwill, a George W Bush confidant and Harvard academic. There was a marked change of tone from a few years ago. "We think it is in America's interests for India to become a great global power," he said. "This is a great democracy. It has our values. Our long-term relationship with India is very stabilising for Asia." 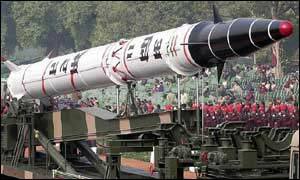 The US has decided it likes India with nuclear muscle.